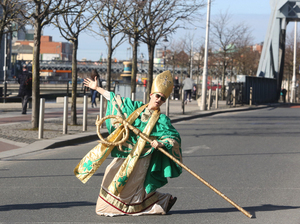 A momentarily buckled Saint Patrick (possibly a jobbing actor) launching the St Patrick’s Festival which starts tomorrow with activities across the city and runs until the 19th. St Patrick’s Day Parade 2017 route. The parade starts from the northern edge of Parnell Square, near the Hugh Lane Gallery, at 12 noon. Posted in Misc and tagged St Patrick at 1:52 pm on March 15, 2017 by Broadsheet. He gets crozier every year. Oh, Spagh, proving the pen is mitre than the sword. Has anyone actually seen the state of the parade route? 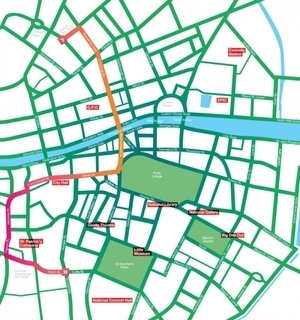 The Luas Works has O’connel St through to college green in a right mess.